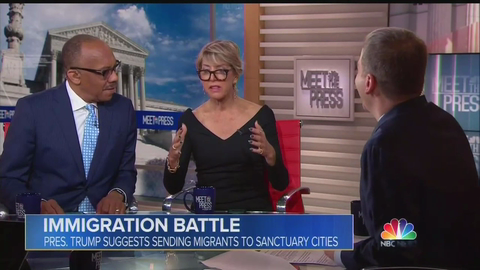 As a member of the panel on Sunday's Meet the Press, Eugene Robinson of The Washington Post repeatedly dismissed the idea of a crisis on the border. According to Robinson, "we're a country of 330 million people, you know, richest, most powerful country on Earth. Yes, we can deal with 50,000 families, you know...people on the border...Let's build the facilities and put the people in place and let's get it done." Robinson apparently had no desire whatsoever to address the asylum loopholes; instead, he just suggested ideas that would merely put a band-aid on the problem. While Danielle Pletka of The American Enterprise Institute argued that the situation at the border is "a genuine crisis," she accused President Trump of widening "the chasm between himself and proper governance" and warned of "another year and a half of mismanagement...lack of governance...and of genuine democratic crisis."